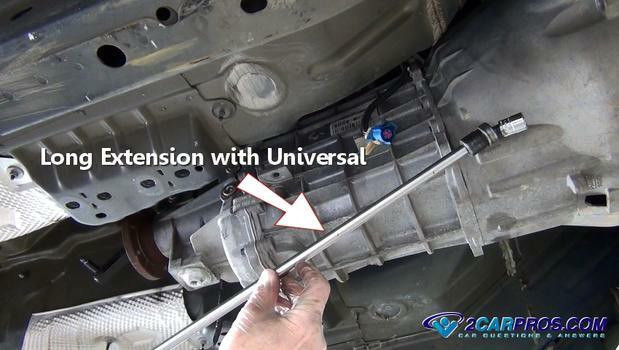 Easy to follow step by step guide on how to replace or remove an automotive manual (standard) transmission for rear wheel drive vehicles, though appearances may vary, the process is the same on most vehicles. 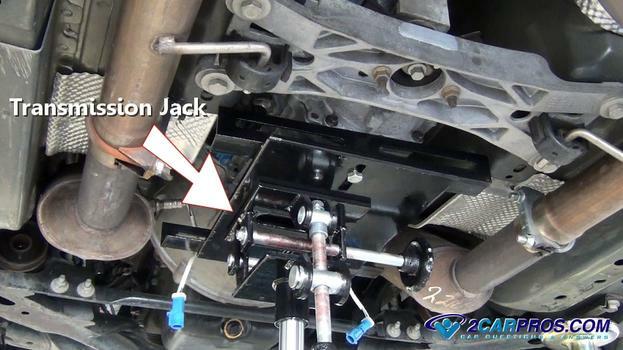 Hoist or hydraulic jack with stands. 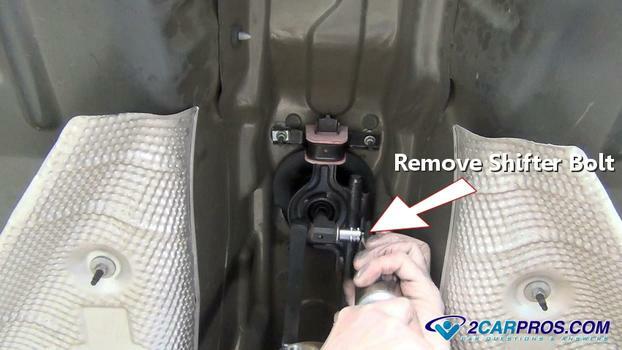 Begin with the vehicle lifted enough to access the transmission while using jack stands for safety, wear protective eyewear and gloves. 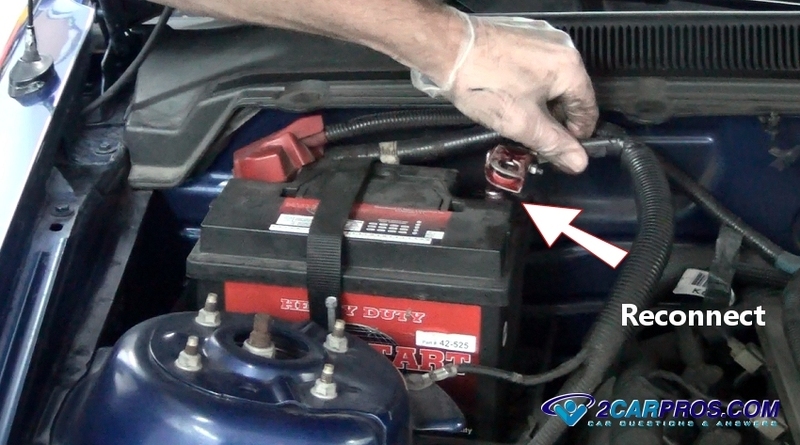 Step 1 - Start by removing the negative battery cable end to help prevent electrical short circuits while the job is being done. 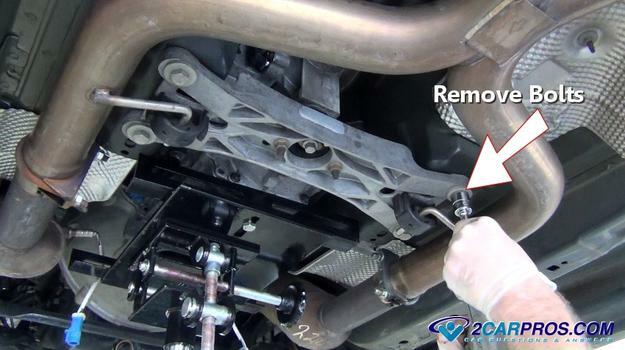 Step 2 - In most cases the exhaust system will need to be removed before the transmission. 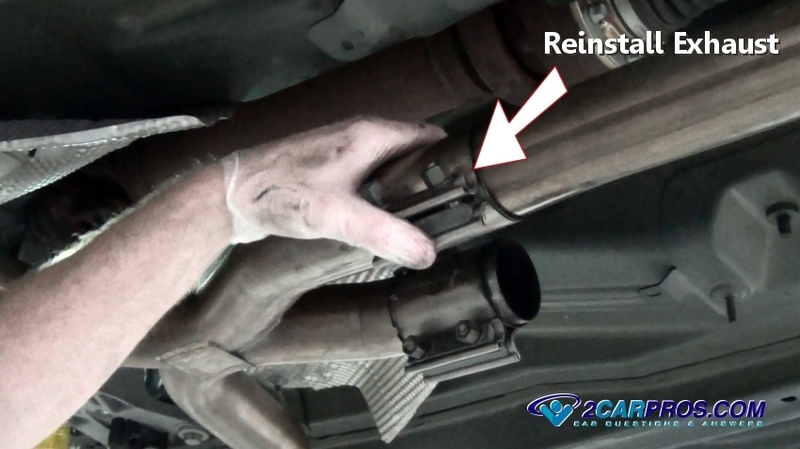 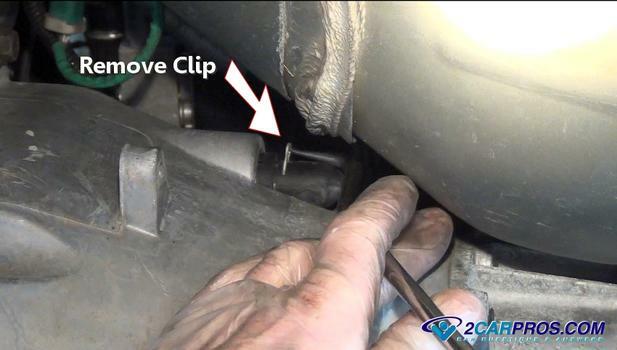 Please visit our exhaust system removal guide for further instructions. 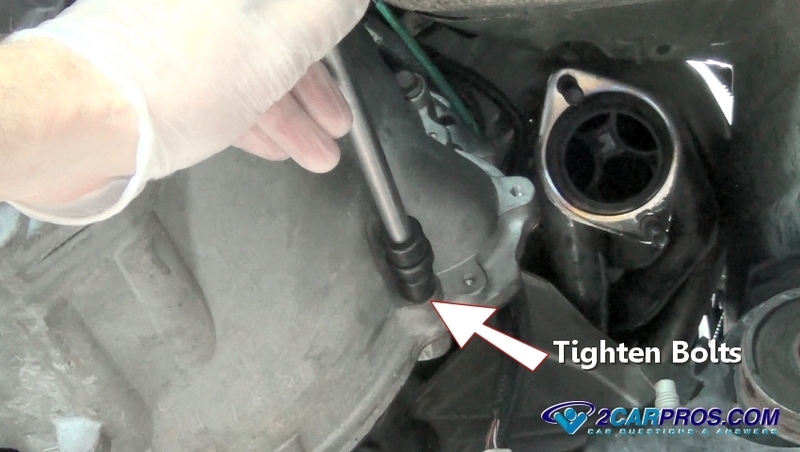 Step 3 - Once the exhaust system has been removed, start by removing the driveshaft mounting bolts. 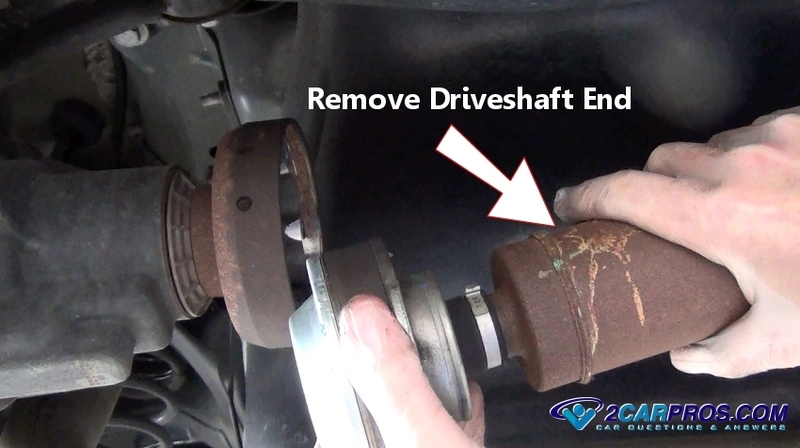 Step 4 - Pull the driveshaft slightly forward and down to separate it from the differential. 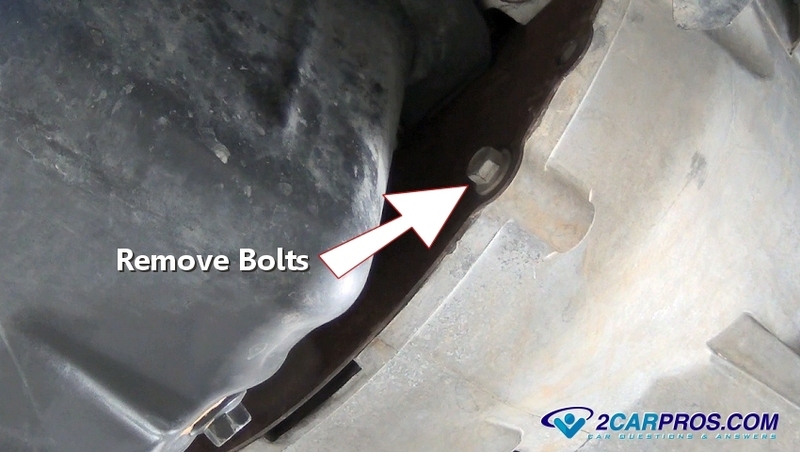 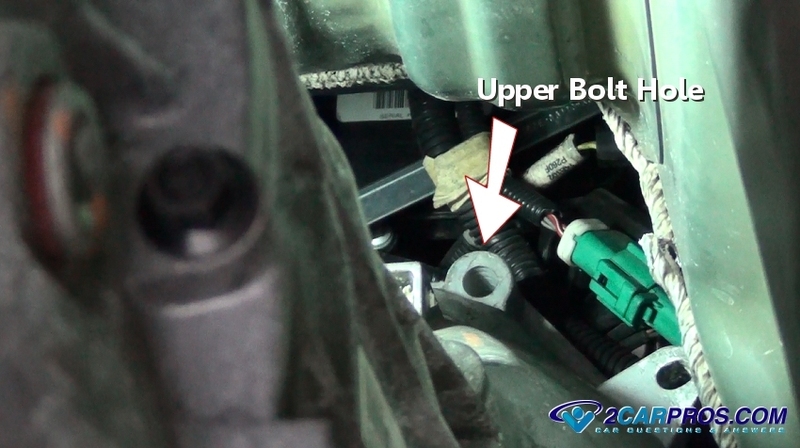 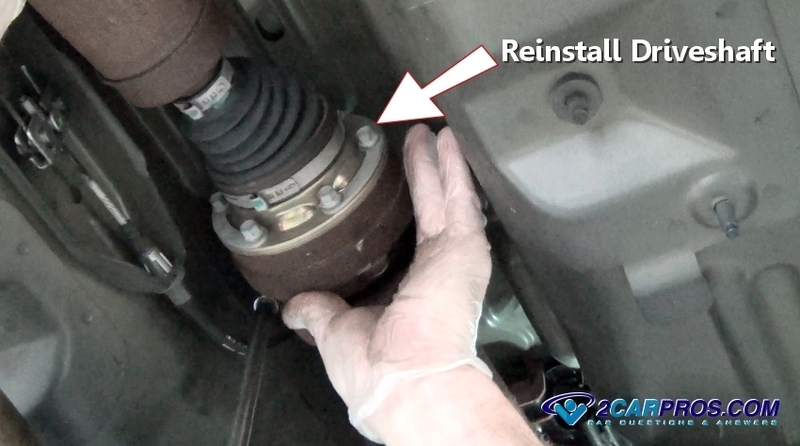 Step 5 - Locate and remove the driveshaft carrier bolts (Note: Some vehicles do not have a carrier, skip this step). 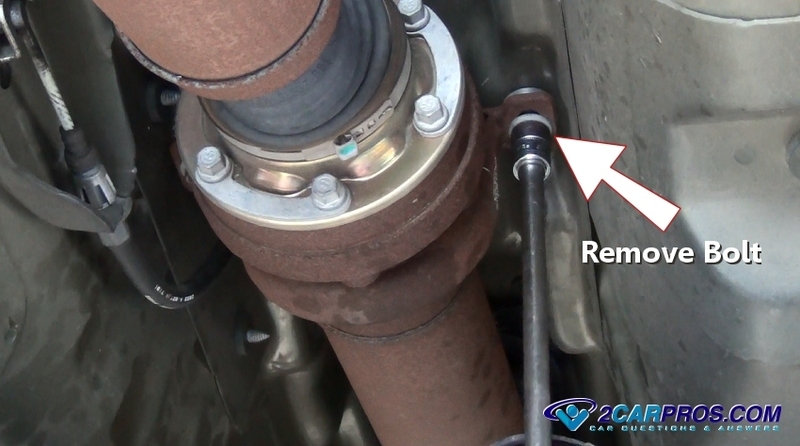 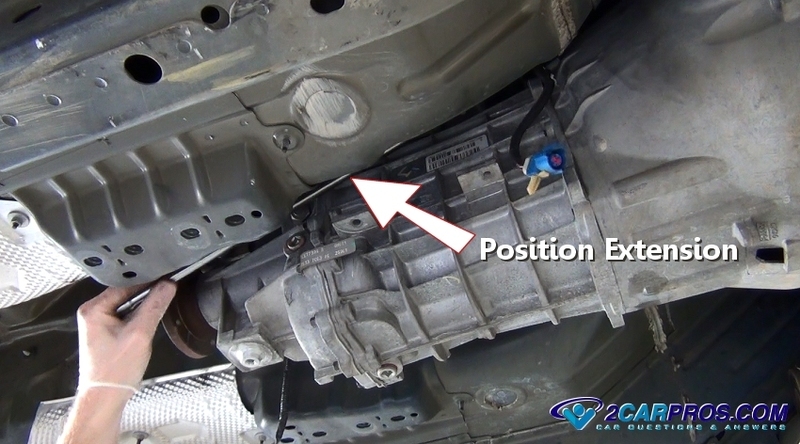 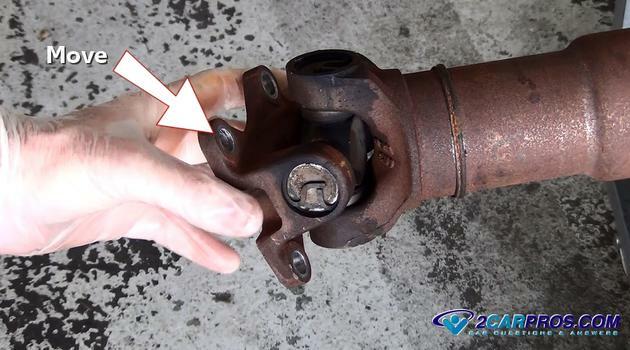 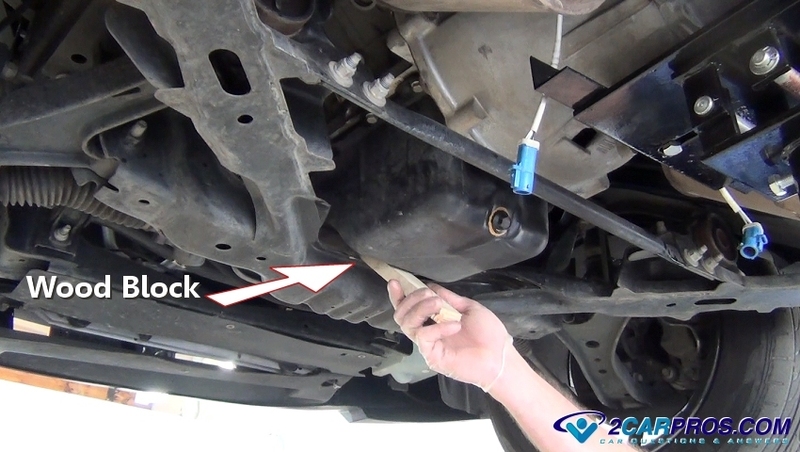 Step 6 - Locate and remove the front driveshaft mounting bolts, the driveshaft will become loose so keep your hands on it, (Note: Some vehicles have a slip yoke that can be simply pulled out of the transmission). 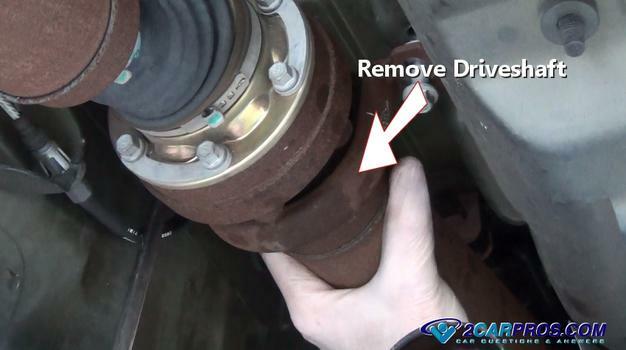 Step 7 - Gently lower the driveline from the vehicle. 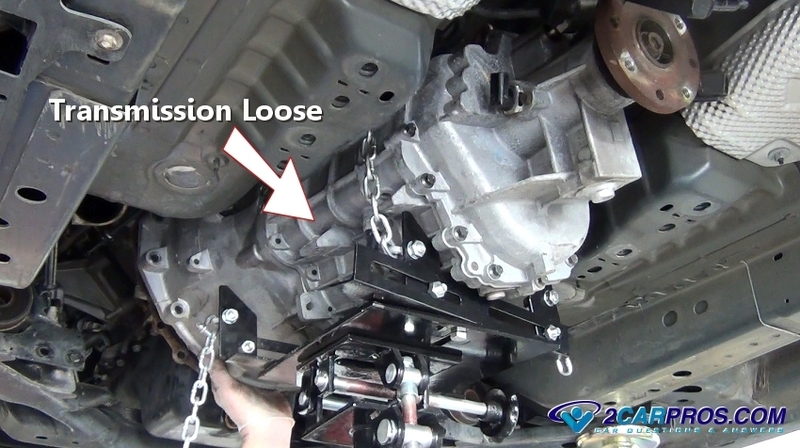 Step 9 - Position a transmission jack under the transmission case and raise it slightly, enough to lift the weight off the transmission mount. Step 11 - Next, remove the transmission mount bolts or nuts, the cross member will become loose, keep your hands on it. 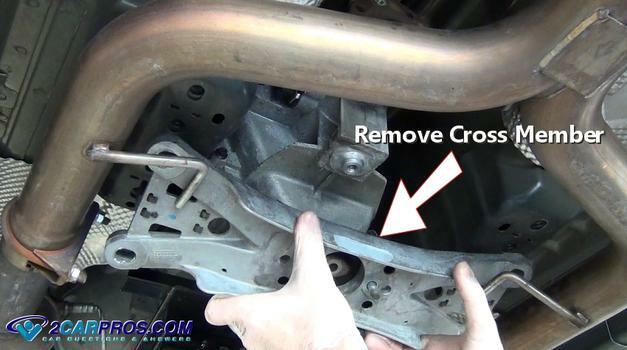 Step 12 - Grasp the cross member and remove it from the transmission and body. 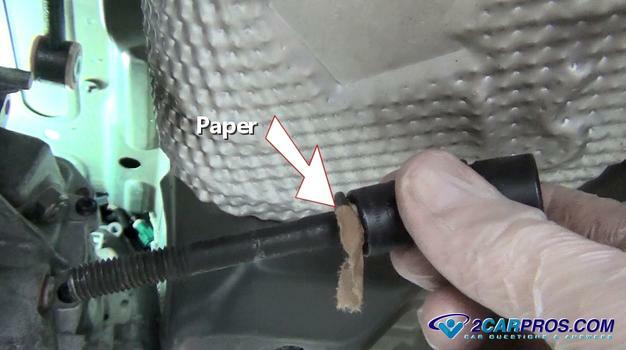 Step 13 - Use a wood block to sandwich between the engine pan and frame of the vehicle, this will support the engine once the transmission is removed, slowly lower the transmission jack, the wood will compress slightly. 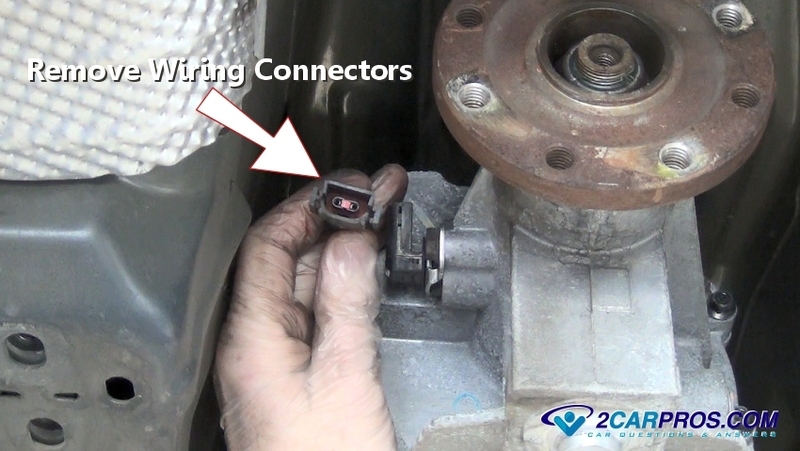 Step 14 - Once the transmission has been lowered slightly, remove all wiring connectors such as the vehicle speed sensor VSS. 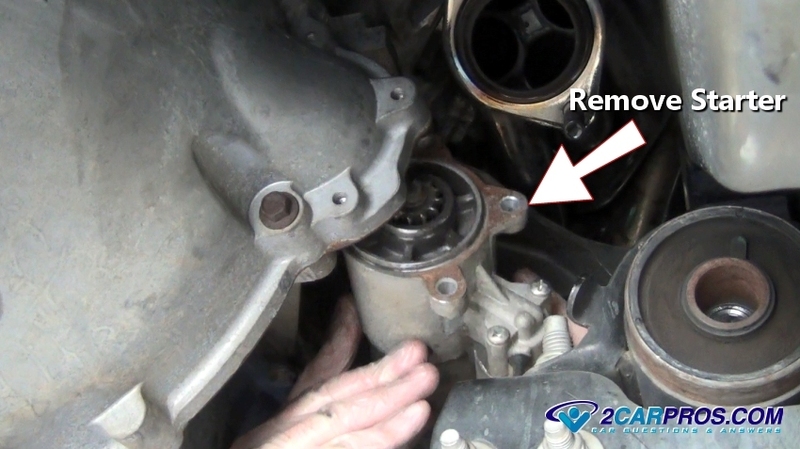 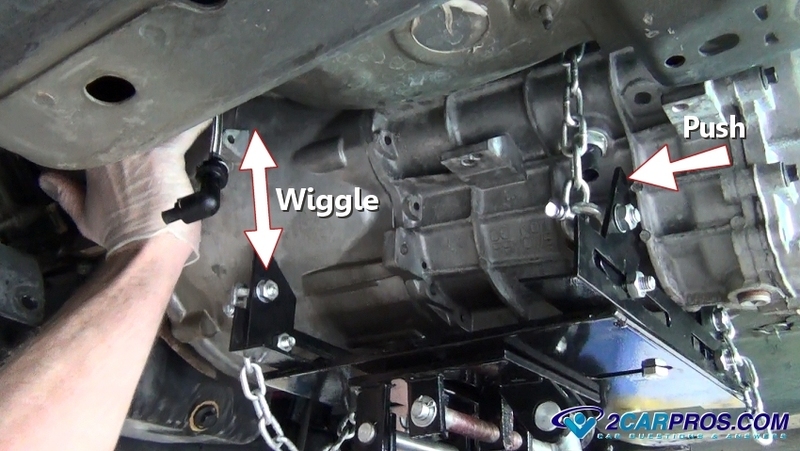 Step 15 - Next, remove shifting linkage, this will vary, for example, some transmissions have a plate where the shifter enters the transmission, this must be removed. 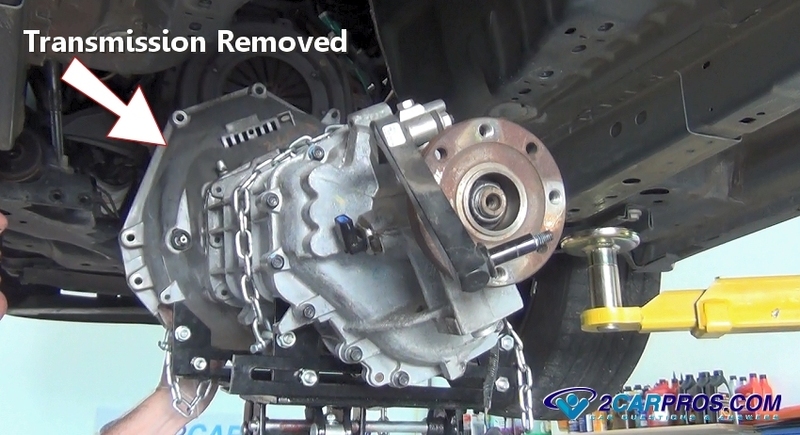 Step 16 - Some starter motors are bolted to the transmission bell housing and will need to be removed. 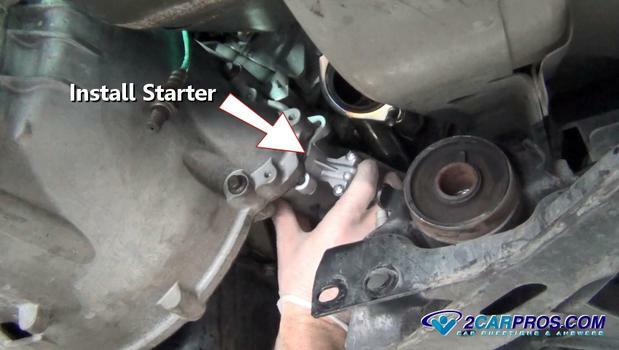 Please visit our removing starter for further instructions. 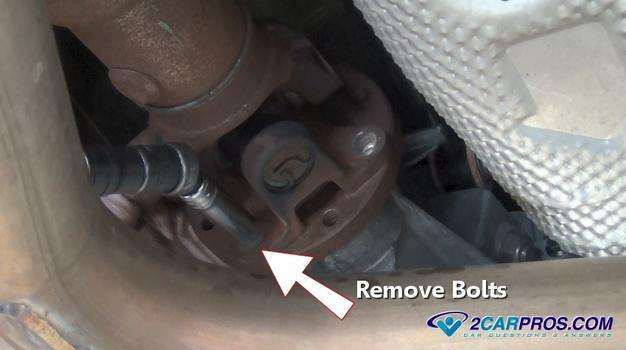 Step 17 - Using a pick or screwdriver, gently pry the retainer clip from the clutch hydraulic line at the bell housing, (Note: If an externally mounted secondary cylinder or cable is used, unbolt or unclip from the transmission). 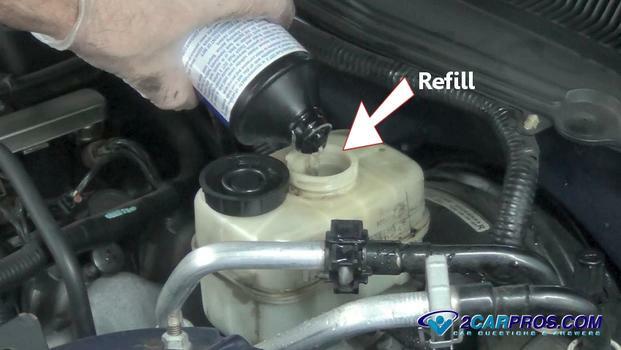 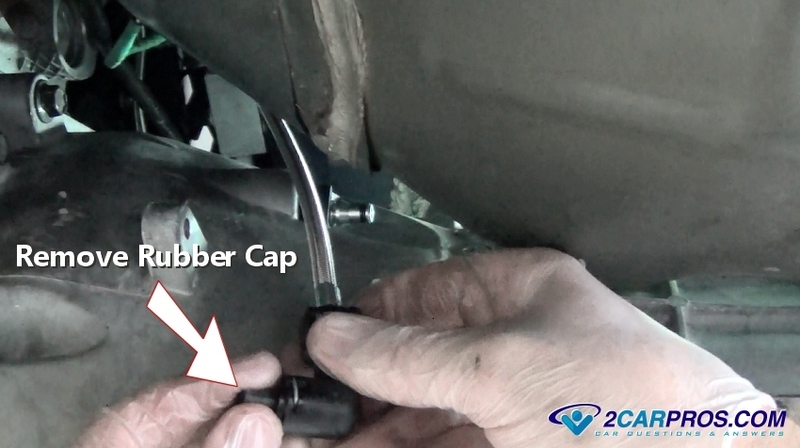 Step 18 - After removing the retainer clip, gently grasp the line and pull it from the slave cylinder, fluid will start to leak, insert a rubber cap to stop the leak. Step 19 - Locate and remove all engine plate or dust shield bolts from the bell housing. 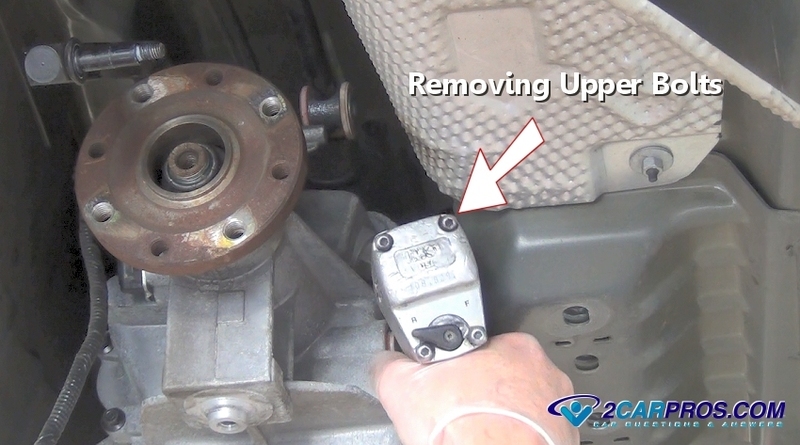 Step 20 - At this point everything on and around the transmission has been removed or disconnected except for the main engine to bell housing mounting bolts, the upper bolts can be difficult to remove unless a long extension with a universal is used. 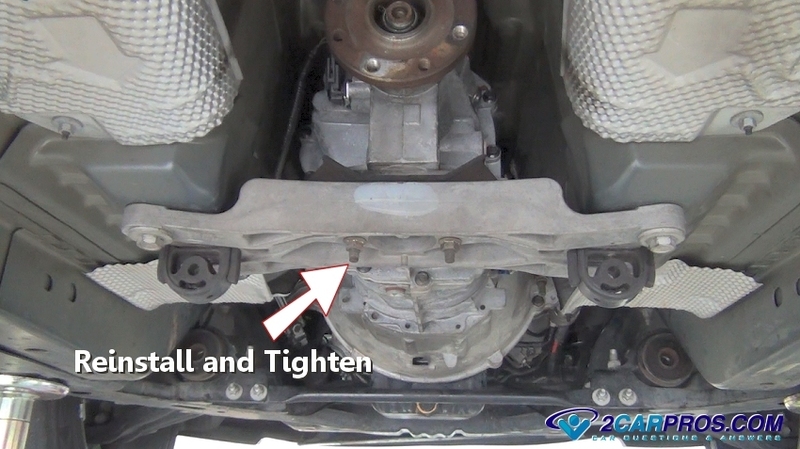 Step 21 - Guide the extension over the top of the transmission to gain access to the upper bell housing bolts. Step 22 - Remove upper bell housing bolts. 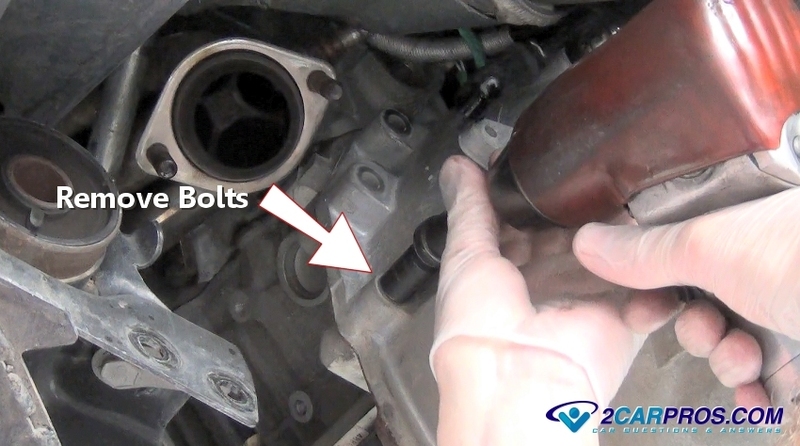 Step 23 - Use a flashlight to check that all but the bottom two bell housing bolts remain. 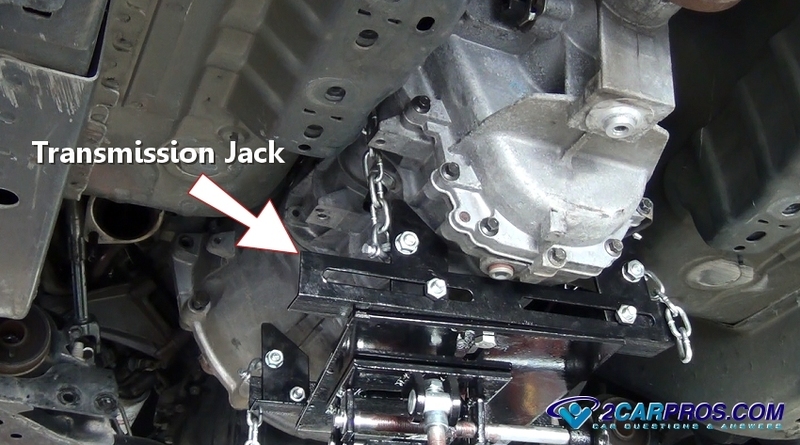 Step 24 - Securely reposition the transmission jack underneath the transmission and attach the safety chains around the case to avoid damage and injury. Step 25 - With the transmission supported by the jack, remove the last two bell housing bolts. Step 27 - The transmission will then be loose behind the engine, keep the transmission steady as you begin to lower it. 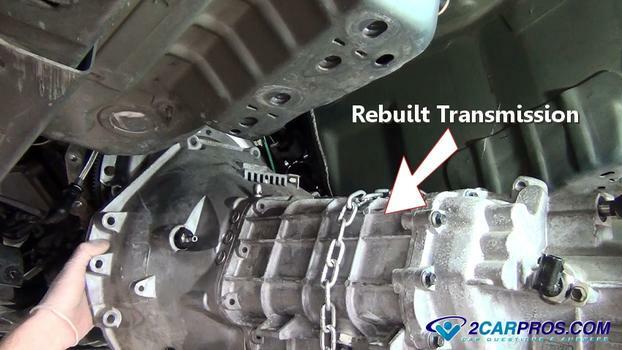 Step 29 - Once the transmission has been removed inspect the rear of the engine for damage or leakage, the clutch, flywheel and rear main seal will now be exposed and ready for repair. 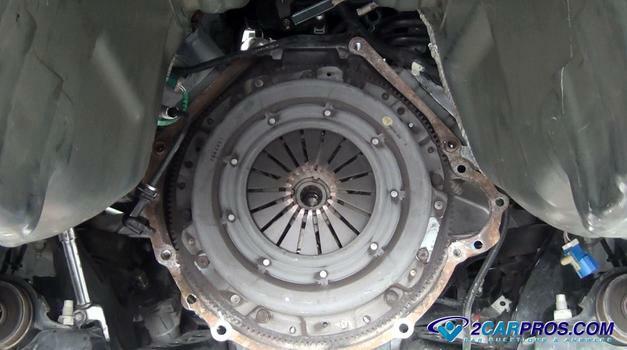 To replace your clutch please visit our clutch replacement guide. Step 30 - After repairs have been made or new/rebuilt transmission positioned on the jack, slowly raise the unit into position behind the engine. Step 31 - When bringing the transmission up to the engine and while the installation is in progress, keep the gap between the engine and transmission equal, clean all wiring harnesses and vacuum lines etc. 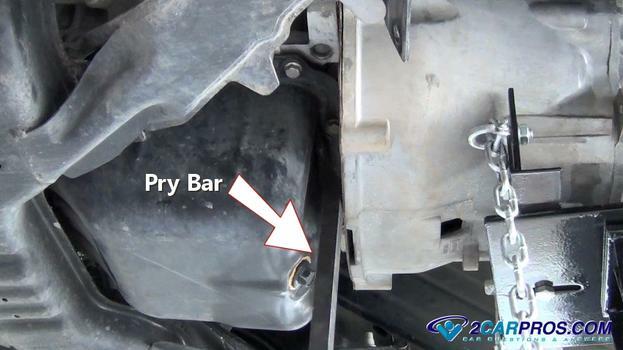 from between the engine and bell housing, this is a common problem, (Note: If the transmission is allowed to hang from the engine at this point it could bend the disc which will cause the clutch not to disengage). Step 33 - Once the input shaft is fully in the clutch disc, the gap between the engine and transmission will begin to close. 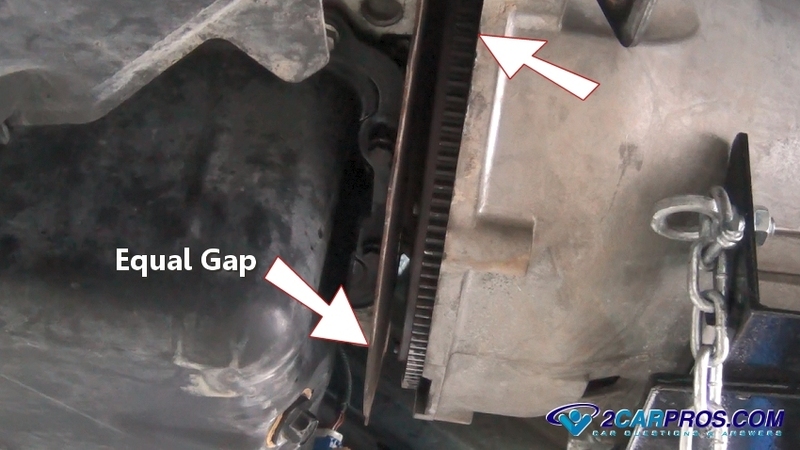 Step 34 - While keeping the gap even, install one mounting bolt on each side and slowly tighten (evenly) to close the gap completely. 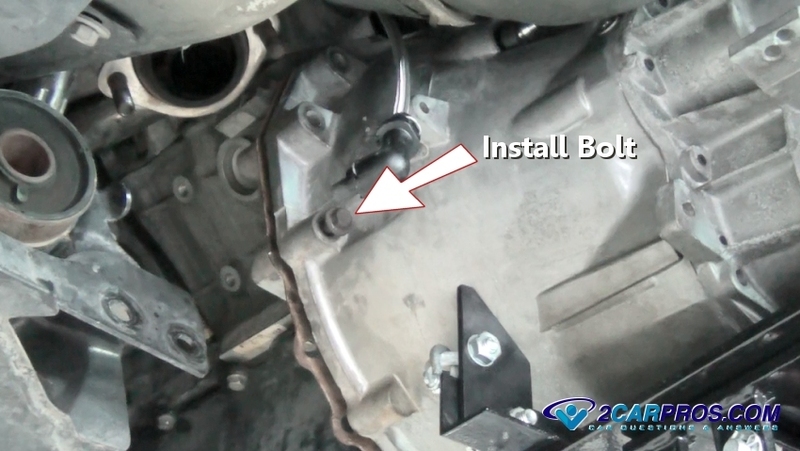 Step 35 - Continue to install and tighten and bell housing bolts evenly. 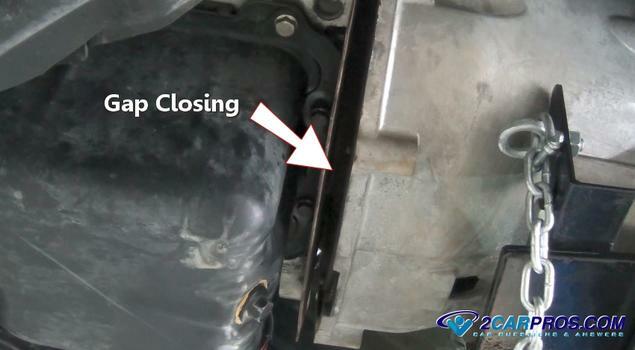 Step 36 - Upper transmission bolt holes can be difficult to access. Step 37 - An old automotive trick is too add a small piece of paper to wedge the bolt into the socket for easy installation. 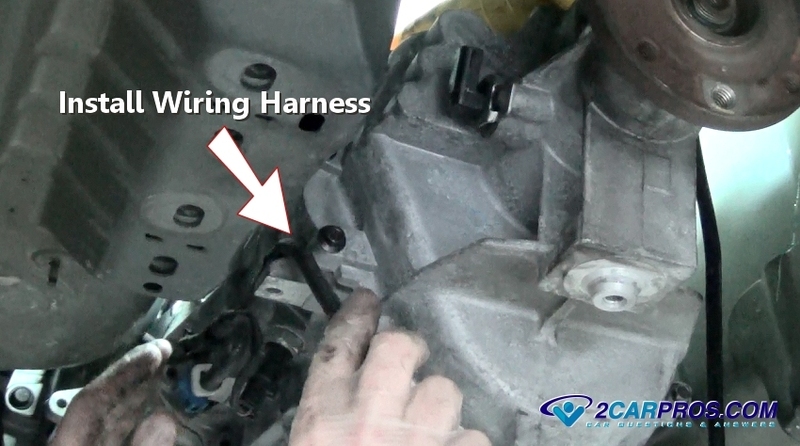 Step 39 - Reinstall the starter motor and attach wiring and cable. 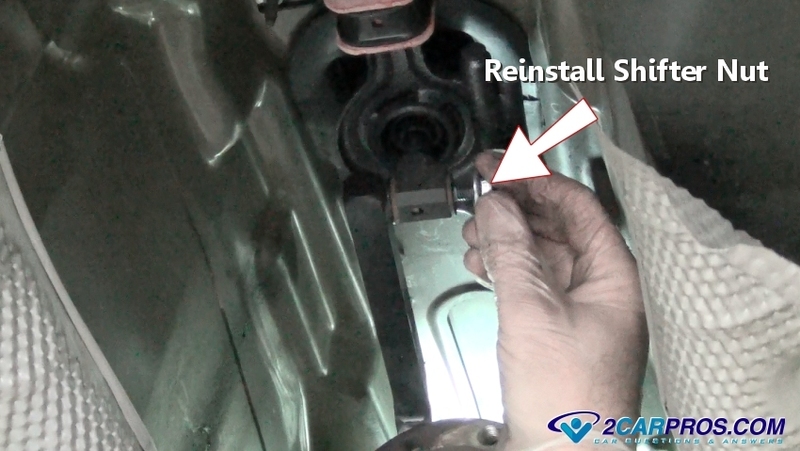 Step 40 - Reroute and install the transmission wiring harness and connectors to the reverse light switch and vehicle speed sensors VSS. 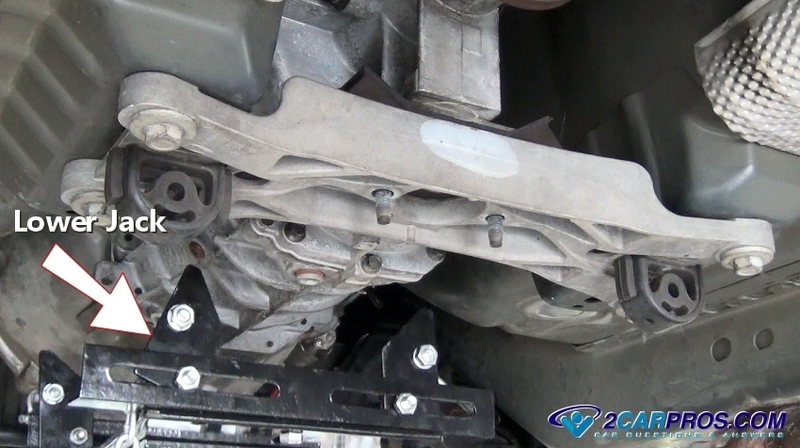 Step 41 - Reinstall shifter and strut rod mounting nuts and bolts. Step 42 - Raise the transmission jack up into position, install the transmission cross member mounting bolts and tighten. 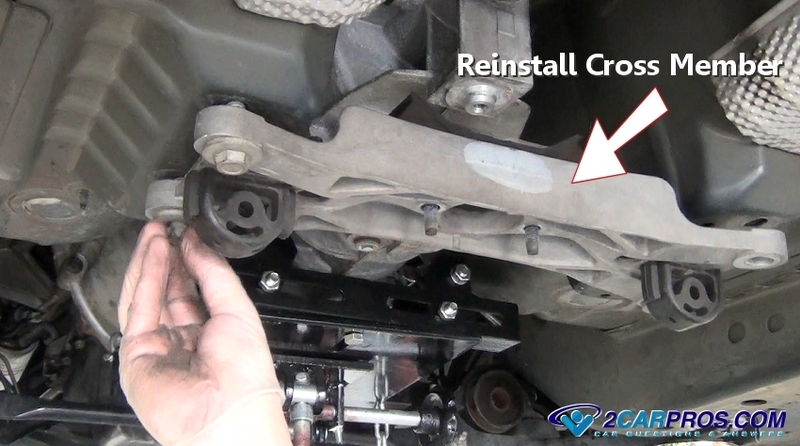 Step 43 - Once all cross member bolt are tight, lower the jack while guiding the transmission mount into place, install and tighten nuts/bolts. 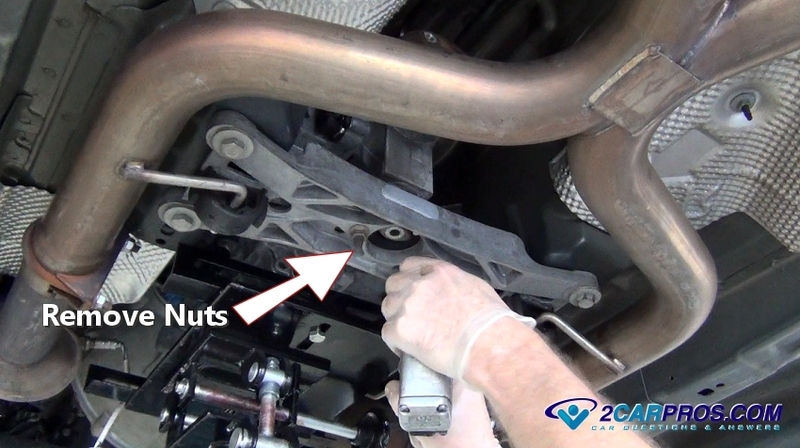 Step 44 - Reinstall the transmission mounting nuts and bolts. 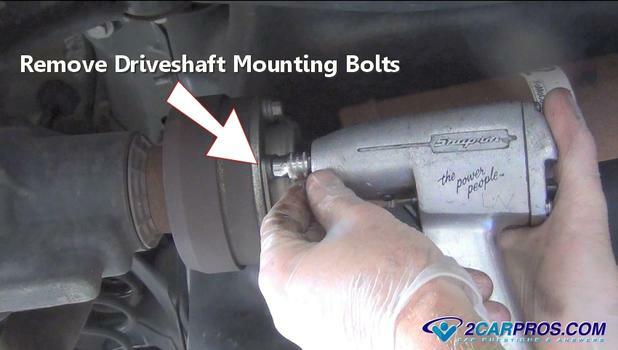 Step 45 - Reinstall the driveshaft by installing front mounting bolts, or sliding the spline into the transmission, finish by tightening the differential flange mounting bolts. 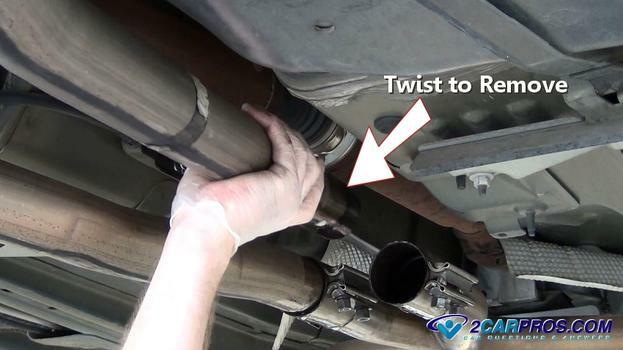 Step 46 - Reinstall the exhaust system including gaskets and hangers. 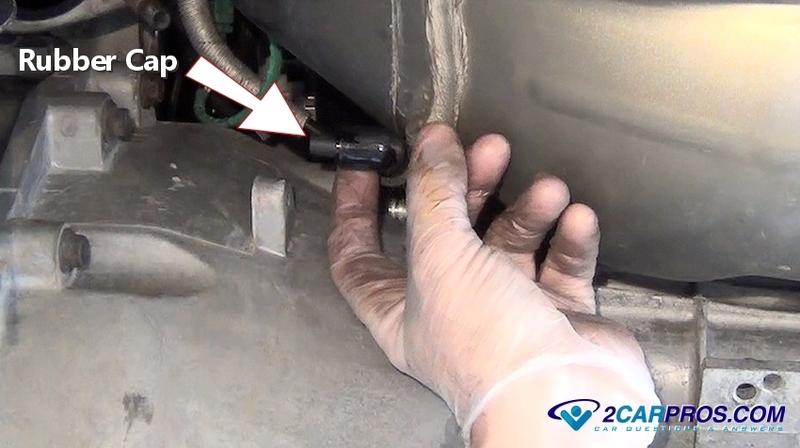 Step 47 - Once the job is completed, check and refill the transmission fluid, use a flashlight and inspect for any missing nuts, bolts or connectors. 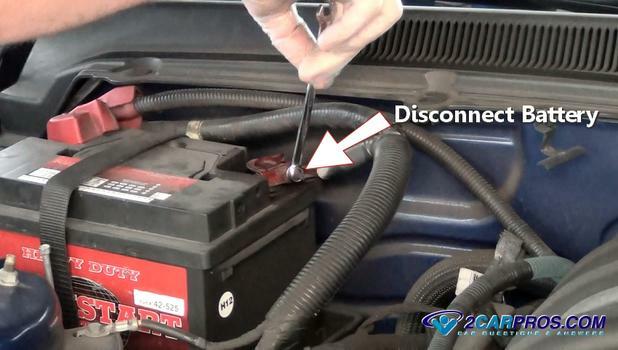 Step 48 - Lower the car and reconnect the battery, there might be a small spark while connecting, if a large spark occurs, recheck starter connections. Step 50 - Most hydraulic clutch systems are self bleeding, just pump the clutch pedal until normal pedal operation returns. 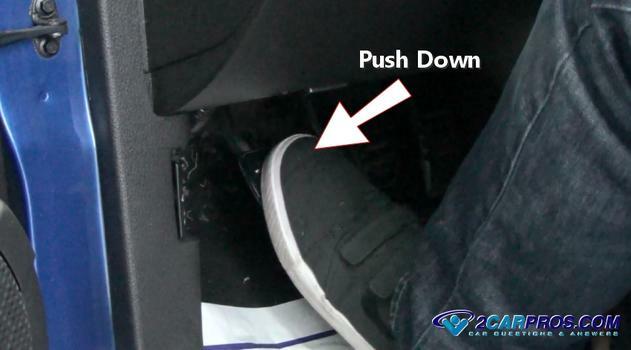 When test driving a vehicle after a major repair listen for any strange noises or sounds which can be an indication of a problem that will need further investigation.